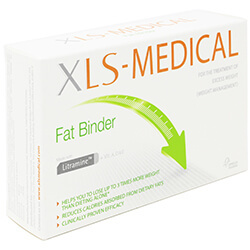 It is available to people with a BMI over 30 and is a prescription only item. Orlistat 120mg Capsules is the generic (unbranded) version of Xenical. When used in conjunction with a reduced calorie diet, Orlistat can be used for obesity management, including weight loss and weight maintenance. Orlistat works in your digestive system to block one-third of the fat in the food you eat from being digested*. The daily intake of fat, carbohydrate and protein should be distributed over three main meals. Orlistat pills can also block the absorption of some vitamins. You may wish to take a multivitamin supplement along with making sure to keep a well balanced diet, rich in fruit and vegetables. 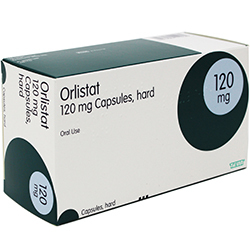 The usual recommended dose of Orlistat 120mg is to take one capsule three times a daybefore, during or up to one hour after each main meal. Avoid foods containing fat such as biscuits, chocolate and savoury snacks between meals. Do not chew the capsule - swallow whole with a glass of water. If you miss your meal or have a meal low in fat, you should not take your dose of Orlistat pills. If you have been advised to take a multivitamin preparation, you should take it at bedtime or two hours after taking Orlistat. The active substance is orlistat. 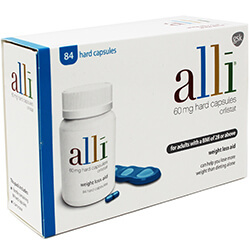 Each hard capsule contains 120mg of orlistat. • low blood sugar levels (experienced by some people with type 2 diabetes).